Based in Harker Heights, Texas, Timothy Onkst has been writing about sports, fitness and health since 2003. His articles have appeared in a variety of publications including "Texas Roundball" magazine, Yahoo Sports, Fox Sports and other websites. 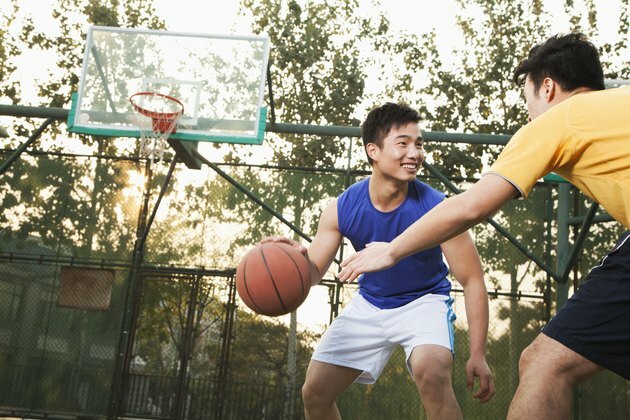 The game of basketball has many rules to help maintain control and keep the game flowing smoothly. Players must abide by them and in order to understand the game, it's important for fans to learn the rules. Some rules, especially those regarding the throw-in, can be confusing. The throw-in inbounds the ball after certain situations -- a player passes the ball from out of bounds to a teammate on the court. There are several situations in the game when the ball will be thrown in or inbounded. At the beginning of every period except for the first period the ball must be inbounded. After every made basket the opposing team must inbound the ball. The ball must be inbounded after every other stoppage in play. This includes timeouts, fouls, violations, inadvertent whistles or held balls. As a note, the NBA is the only level of basketball in the U.S. that has a jump ball after a held ball situation; colleges and high schools use alternate possession and the ball is inbounded. The rules on inbounding after a made basket are a little different. Any of the five players on the team may take the ball out of bounds. After the inbound passer steps out of bounds, he has five seconds to get rid of the ball or it is a violation. After made baskets, the inbound passer may run the baseline and move back and forth to make the pass. A second player on the inbouding team may step out of bounds in addition to the player inbounding the ball. It is legal to pass the ball to the second player. That player may inbound the ball to any player including the original inbounder. The five-second rule still applies from the moment the original inbound passer steps out of bounds. The defense is not allowed to reach across the baseline and touch the inbounds passer or the ball. The defense is not allowed to touch the ball until it crosses into the court of play. These rules apply for all other inbound situations. Any of the five players on offense may inbound the ball. When the official hands the inbound passer the ball he has five seconds to get rid of it or it is a violation. The inbound passer will be told to hold his spot and cannot run from that spot. He is allowed a three-foot cushion both directions, which essentially enables a step to pass the ball inbounds. The defense cannot reach across the out of bounds line and touch the ball or the passer. The defense cannot touch the ball until it comes into the court of play. It is legal to inbound the ball from the front court to the backcourt; that does not constitute a backcourt violation. When Can a Soccer Goalie Pick Up the Ball? What Is the Football 10 Second Runoff Rule?